New binary options brokers pop up from time to time, but most are not worth paying much attention to. Once in a while, a new one comes along and creates a lot of excitement within the trading world. Porter Finance is one of these brokers. They have a dynamic new platform geared toward helping their customers have the easiest time trading possible, thanks in part to the vast amount of experience that their team has. It doesn’t matter if you are brand new to trading, or if you’ve been trading binary options for several years, this is already a top site despite the fact that it’s been around for only a couple months. Before we go into the details, let’s get this out of the way quickly: Porter Finance is a different type of broker because of their support team. Most binary options brokers do offer similar products. The difference is how they are presented, how easy they are to use, and how much help you can get when you need it. This broker has an excellent customer service department, and this says volumes about their product. It means that they value their customers and want to see them succeed. Don’t get this wrong, Porter Finance is a business. However, they have embraced a fact that a lot of other sites have not: that a good business cannot keep being good if they don’t provide value to their customers. Trading at the site is easy once you open an account. They have your typical call and put options, of course. They also have popular exotics like pairs, one touch, and ladders. The average successful trade here returns over 80 percent in profits, sometimes as high as 83 percent for some assets. This places them well above the industry standard. You can select your asset from a drop down box, making navigation simple. You can do the same with your expiration time, and the amount that you want to risk can just be typed in. The minimum trade amount is $25 per trade. You can choose from indices and stocks, commodities, and currency pairs. Many of the underlying assets that they offer are not offered elsewhere, such as the Tel Aviv 25 index. Once you create an account, to trade you will need to make a deposit. You can use a MasterCard, Visa, American Express or Discover to do this, a wire transfer directly from your bank, or an online wallet, such as Skrill or CashU. They’ve tried to make it easy for anyone that wants to make a deposit by offering more choices than any other broker out there, which goes back to their emphasis on service. Everything that they do is secure with SSL encryption measures taken to protect your information and give you peace of mind. Also, you can use several different currencies to trade here. These include the U.S. dollar, the Australian dollar, the British pound sterling, the Japanese yen, the euro, the Canadian dollar, the Swedish krona, and the Russian ruble. Once you select a currency, you cannot change it. Once you are ready for a withdrawal, you will need to provide further proof that you are who you say you are. This is normal in the financial industry in order to prevent fraud and protect clients. Usually, this can be done with a government issued photo ID card and a utility bill that displays your address. These can be scanned and emailed over to their customer service department and your withdrawal request is processed soon after. Sometimes it can take a few days to get your withdrawal to your bank, but again, this is completely normal and the only safe way to do this at the moment. To make a deposit, you will need to make a minimum deposit of $200. The maximum withdrawal depends upon your payment method. Credit cards have a max of $10,000, e-wallets are $5,000, and wire transfers have no limit. The minimum withdrawal for credit cards and e-wallets is $30. Bank transfers are $100. The first withdrawal each month is free, each one after that during the month is $30. This site is easy to navigate with everything clearly marked out on the top bar. 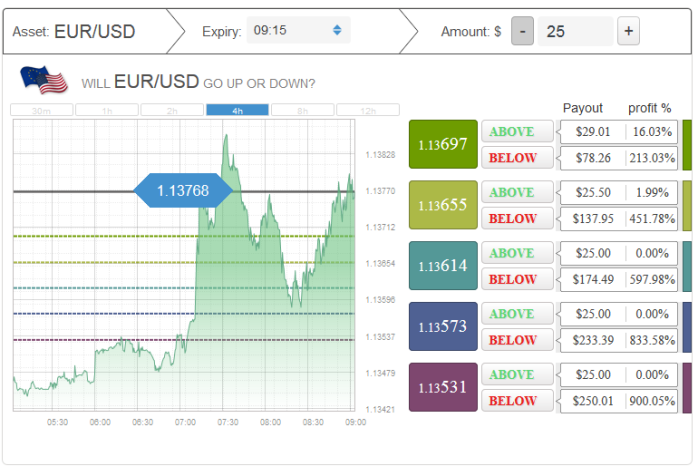 Getting from the trading section to the banking section, for example, only requires a single click. They also have a thorough education section, as well as a market review where information that will help guide your trading day and week can be found, as well as analysis and opinions. This is helpful for new traders, although advanced traders will probably already have this information at their disposal. Still, it’s nice to have on hand when you want it quickly. What it comes down to is whether or not you can make a profit here, and the site owners have done a lot to make it easier here than anywhere else. This is a great positive feature on their behalf. Only time will tell whether or not this broker will continue to be successful, but right now, Porter Finance looks like one of the best brokers in the binary options market.